Governor Dayton, House Speaker Daudt, and Senate Majority Leader Gazelka met multiple times this week to discuss possible compromises in the various budget bills proposed by the Republican controlled House and Senate. In a press conference on Tuesday, House and House Republicans reiterated their desire for Governor Dayton to sign what they consider to be reasonable bills, and claimed that Dayton was being unreasonable by turning down several spending and tax cut counteroffers which included concessions in spending increases exchanged between legislative leaders and the Governor. The Governor fired back with his own press conference, where he firmly stated that he would veto any and all of the proposed bills if changes were not made to keep essential programs and protections in place. The regular session is set to constitutionally adjourn sine die next week on Monday, May 22nd, giving lawmakers until the last minute on Sunday, May 21st to finish any and all business. Any passed bills be must be signed or vetoed by the Governor ten days after passage. In the event that a bill is not signed or vetoed within ten days, it automatically becomes enacted into law. On Friday, Governor Dayton vetoed five of the Republican Legislature’s budget bills after negotiations stalled on a compromise two-year budget. The vetoed budget bills included funding for health and human services, E-12 education, agriculture, state government, and environment. The health and human services veto letter can be found here. 1. 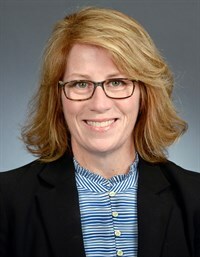 Tell us about what you do for a living when you’re not serving as a legislator.Representative Erin Murphy (DFL-St. Paul) represents District 64A, which covers a portion of the City of St. Paul. She was first elected to the Minnesota House in 2006, and has been reelected 6 times. She formerly served as House Majority Leader from 2012-2014, and currently serves on the Health and Human Services Finance and Reform Committees, as well as on Rules and Administration and Ways and Means. On Tuesday, the Senate voted to confirm President Trump’s pick, Dr. Scott Gottlieb, to lead the Food and Drug Administration (FDA) by a vote of 57-42. Gottlieb formerly served as a Deputy FDA Commissioner during the George W. Bush administration, and is widely considered to be competent and knowledgeable on industry matters. In his role as FDA Commissioner, Gottlieb has promised to work to quickly implement mandates included in the 21st Century Cures Act, as well as expedite the FDA’s new drug and generics approval process by relaxing clinical trial requirements. The legislation would aim to make medical technology products designated by the FDA as “breakthrough” covered through transitional periods by CMS. The Medical Alley Association is supportive of this legislation, has signed onto a letter in support organized by the AdvaMed State Medical Technology Alliance (SMTA), of which Medical Alley President & CEO Shaye Mandle is the current Chairman. You can see a white paper on the legislation here and the letter of support here. The U.S. Senate HELP Committee marked up Medical Device User Fee Agreement (MDUFA) legislation and voted to advance it out of committee on Thursday. MDUFA IV contains provisions that aim to reform the FDA inspections process, streamline classification of device accessories, as well as provide guidance language. The legislation will now move to the U.S. House Energy & Commerce Health Subcommittee for mark-up on the House language next week.